← Why We Don’t Charge Admission to the Museum. Several years ago someone donated a number of items which were immediately incorporated into various displays. –Except for a bag of charcoal of which I hadn’t really paid much attention. At casual glance it hadn’t seem to “belong” anywhere. So it has lingered in a corner, waiting. Till today. Today I looked again and realized what it was. Henry Ford began producing Model T cars in 1908. By 1914 the Ford Motor Company was producing thousands of cars a week and just 5 yrs. later Ford was selling a million T’s a year. Each car required 100 board feet of lumber for the running boards, frame, wheel spokes and the dash board. Ford was using so much wood in the production of Model T’s that he wanted to go into the lumber business for himself. Every year Henry and his friends (including inventor Thomas Edison, naturalist John Burroughs and tire builder Harvey Firestone) went on a camping trip. They traveled in a six car caravan which included a full mobile kitchen. They called themselves the “Vagabonds”, and their well publicized trips made camping “cool” for the American public. For the 1919 trip, Henry included Edward Kingsford (a cousin-in-law) because Henry wanted to talk with him about buying forested land in Michigan’s Upper Peninsula. Shortly thereafter, Ford bought 313,000 acres, where he built a sawmill, a parts plant and a company town he named Kingsford. The new mills and factories were soon producing all the wood parts needed, but there was a great deal of wood scrap and saw dust left over. Mr. Ford abhorred waste, so applying an invention of Orin Stafford (a chemist in Oregon) Henry had the waste wood turned into charcoal, which was then pressed into briquettes using corn starch and tar as a binder. 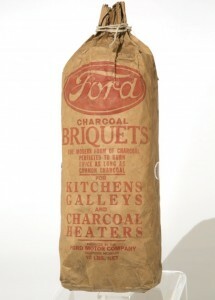 Ford Motor Company Charcoal eventually was renamed Kingsford Charcoal, which is now America’s most popular maker of charcoal. The company uses a million tons of wood a year making it’s ever popular product. Henry Ford not only invented one of the most popular cars ever sold, created one of America’s most successful businesses and invented the revolutionary assembly line, …he also changed American life and leisure by making possible and popularizing the great American barbecue.